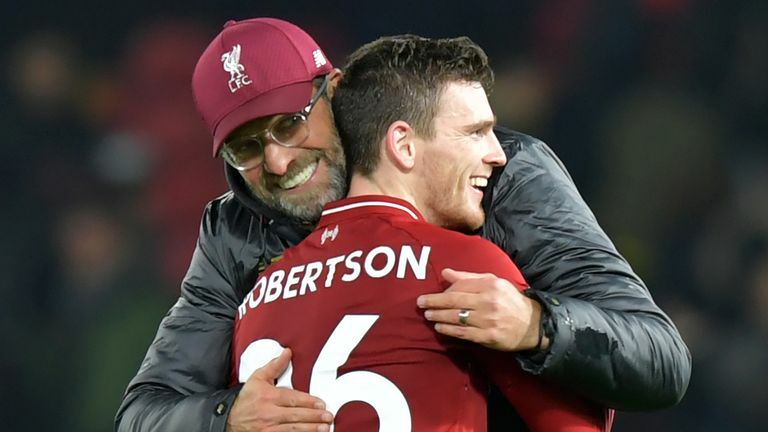 Jurgen Klopp says Andy Robertson's contract extension is a "good sign" for Liverpool as he looks to build a squad "for the future". He said: "I am very happy about it, it is really cool. It is a very special story with Robbo. I still love his improvement - his development has been outstanding. "Nobody could expect it but we were hoping for it. It is nice to have this boy around. He is not only a fantastic player but an even better person. "I have improved my Scottish a little with him which helps with all my conversations with Kenny Dalglish!" "In general it is always a good sign for a club when you have the opportunity to extend contracts early," he said. "This team, if we can keep these boys together, it is a very good age group. We are really in the middle of their development so this is good news for Liverpool. "There are 17, 18 players plus the really young boys, it is a squad for the future."